OK I'm stuck. I will try to explain my problem and hopefully there is a simple solution that a newbie will able to fix. I have an A600 with a bootable 8GB CF card(replaced 40 MB HD), 3 partitions 1st WAS bootable with WB3.1. Everything was working fine, and I was in the process of transfering some ADF's and configuring the system to my tastes (MagicWB, MagicMenu, and a few other goodies). I also have the Amigakit PCMIA CF unit with Easy ADF software. My problem started when I copied the extracted AMINET CD49 from my CF card reader to one of the partitions on my CF hard drive (DH1). I thought I had figured out the assign command so I could browse the CD off the CF DH1 partition. I had to go out for a while so I shut down the computer and when I turned it back on, the CF HD card is NOT recognized and I get the purple WB31 insert disk screen. Is what I did by using the assign command screw something up, write something to my boot sequence, and can I recover from this easily? I tried reading the card in the CF card reader and it comes up as a NDOS formatted disk where the CF card supplied in my ADF kit reads fine. I tried the mouse bootup sequence, but again my card is not recognized and only my DF0 is shown. I replaced my 2.5 HD back in the system, and that is fine. I'm lost being a newbie and trying to find my way but now I have an 8GB cf card that is unusable as is. Any suggestions or help would be great. Didn't you know that you need special software to access more than 4GB ? Your problem sounds clearly as if you tried without. Writing to DH1 overwrote the partition table and most of DH0. I doubt that there is anything you can do to recover. Now you have to start from the beginning again, i.e. initialize and partition the CF card, install the OS etc. But this time only create partitions of 4GB in total. Leave the upper half of the CF card empty until you installed the needed drivers. This have been reported in the tread linked above by thomas, however I would like to point out: 4GB max in total AND 2GB max for each partition. There is no partition size limit with FFS, at least not with Kick 3.1. It is a good idea to keep partitions smaller than 2GB, though, because some programs behave strangely if they see more then 2GB free space. For example the installer might refuse to install a program because it thinks that less then 0 bytes are free (everything above 2G becomes negative when treated as signed number). But this can be worked around, for example by using a newer version of the installer. There is no physical partition size limit. ...then these could be good reasons to consider the 2GB limit. If false I ask you and please confirm me, would you not get strange values on formatting & partitioning hard drive >2GB with standard HDToolBox (WB2.x) on A600? Do tools like DiskSalv or ReOrg (not coming from WB pack but both enough known) work on partitions >2GB? 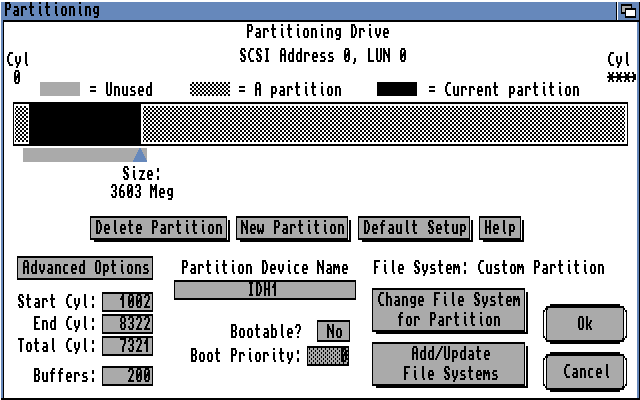 would you not get strange values on formatting & partitioning hard drive >2GB with standard HDToolBox (WB2.x) on A600? No, you won't. HDToolbox shows correct numbers up to 4095 MB. I am quite sure that DiskSalv works fine on 4GB partitions. I consider ReOrg dangerous anyway so I never tried it. If I need to make a backup before I run ReOrg anyway, then I can as well format and restore the backup. Needs as much time and is safer. Thanks for your info cosmicfrog & thomas. What partition size limits are there with Kick 3.0 and older? Are there any more restrictive size limitations for boot partitions in particular?